Xin and I have been working on defining the different people and cultures of the Moon Hunters world, starting with the mountains, deserts, and forests. 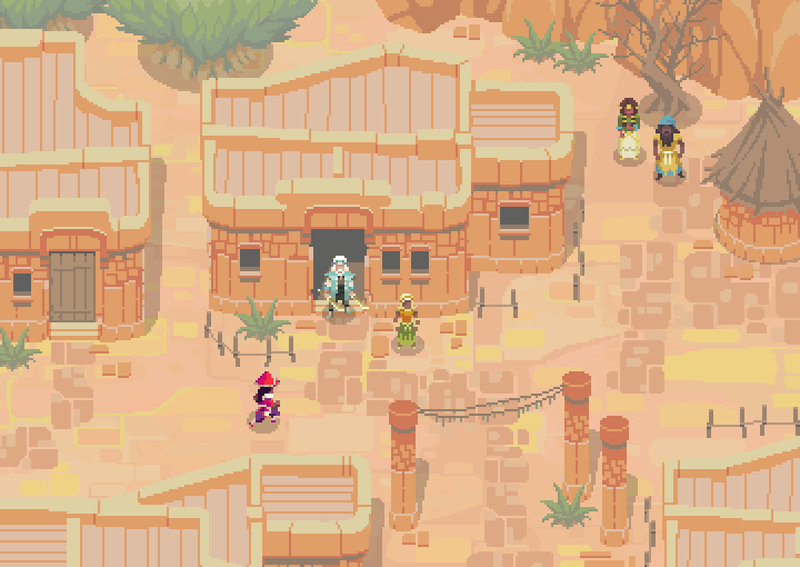 The desert tribes are some of the friendliest, relying heavily on Blood magics to detect water beneath the surface, digging incredibly deep wells as needed. Even the smallest children of the tribe can usually recite basic Blood prayers, giving the desert folk a reputation for quick healing and practical wisdom. Desert priestesses speak of an ancient thirst that draws all of humanity down into the cavernous flesh of the earth, safe from the evil sun. However, two storytellers rarely agree on what happens down there, for those that answer the call and indulge their thirst. 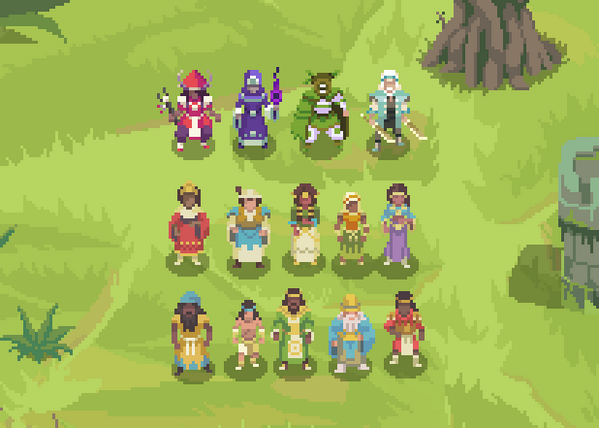 Here’s an assortment of villagers drawn from a few different tribes, side-by-side for comparison with the heroes. The differences can be rather subtle, but you can learn the style and customs of each tribe after spending more time with them. The people of the wind-chapped mountains are hunters, not farmers, as there’s neither enough fertile soil nor sunlight to sustain most vegetables. Even in mid-summer, the evil Sun is a distant, pearly figure, not so much brighter than the Moon. Of all environments, the peaks may be the most similar in night and day, seemingly trapped in a constant dusk. Most tribes prefer to build in wood, mud, or grass, but the High Tribes legends say they moved to a higher elevation to test their strength and self-discipline. They revel in the challenging permanence of stone and metal, with artisans excelling in Bronze magics and careful stonework. As a result, the finest jewelry, metal blades, and architectural advances tend to come from the mountain folk. In addition to hunting for meat and skins, they supplement their supplies with trading. The High Tribes’ most profitable export is in weaponry. The Spellblade wields weapons forged by High Tribes on the jagged peaks of the Zaragos Mountains, where winds ceaselessly dig ore out of the very stone. After many years of hermetic study, training, and meditation, a Spellblade fuses his or her own will into the very metal, until the blade can anticipate its master’s whims. Unfortunately, looking down on the world from their elevated viewpoint, the High Tribes tell themselves that they are closest to the Moon and most deserving of Her power. Most of its leadership are arrogant, possessing very little respect for those with more compassion. 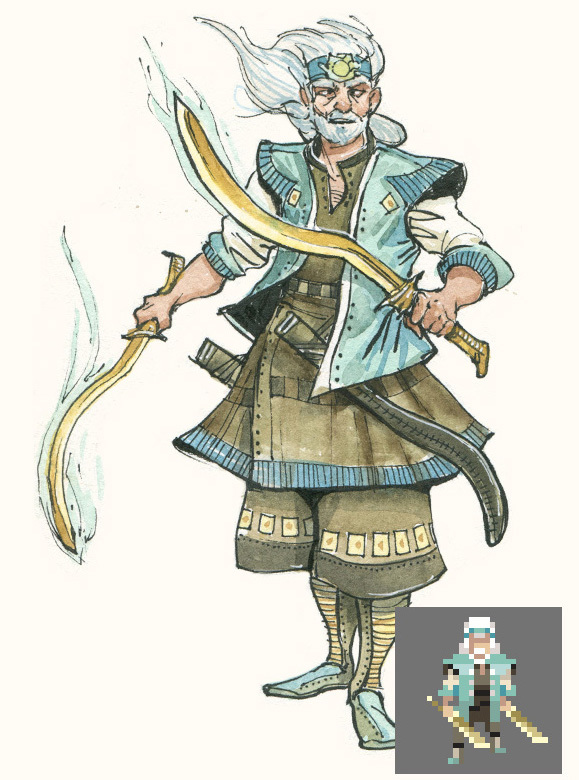 There are always exceptions, of course, particularly among merchants and rebellious youth, but the High Tribe culture is dominated by a sense of prideful superiority, valuing strength, purity, and loyalty over other, “lesser” virtues. A few people have asked whether we’ll crowdfund using the Square Enix Collective, but the honest answer is that we don’t know! Maybe! We haven’t decided yet what the best course of action is. For now, we’re keeping our heads down and working on the game. At this point, we’re hoping to be ready for crowdfunding in July or August. We want to make sure we put our best foot forward and offer as much gameplay footage as possible. In the meantime, we’re glad to have you along for the journey!